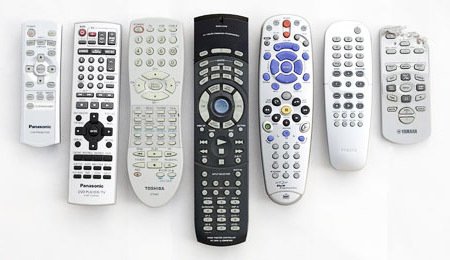 I have 7 remotes scattered around my home theatre. To watch a movie I usually need to search for 3 of them so that I can turn on the projector, control the DVD player and turn control the volume on the receiver. My Onkyo receiver has a learning remote but it’s difficult to program and doesn’t have enough programmable buttons for two DVD players, a satellite receiver, VCR, etc. Solution? The Harmony 880 Advanced Universal Remote from Logitech. The Harmony 880 allows me to control every piece of AV equipment in my house. By connecting the remote to my Mac via a USB cable, I can download remote control functions from Logitech’s website. They have a huge database of remote control codes from a lot of hardware manufacturers. I didn’t have any trouble finding codes for any of my equipment. The Harmony 880 has a colour LCD screen that you can customize — create your own backgrounds in Photoshop, choose from several icon presets and edit the names of any button. You can create up to 8 macros to save time. For example, I created a button called ‘Watch Movie’ that will turn on my projector, set the video input to HDMI, turn on my DVD player, eject the tray, turn on my receiver and set the audio input to the DVD. Whew! I can stop purchasing AAA and AA batteries for all of my remotes. The Harmony 880 is rechargeable and has a nifty docking station that glows in the dark. There is a battery indicator on the remote as well but I found that it keeps the charge for a long time. The remote is also backlit. Whenever you pick it up or tilt it, the screen and backlit keys come to life. You can decide how long the screen stays on or just press the ‘glow’ button to turn it off. I found a couple of surprises when setting up the Harmony 880. The remote for my Panasonic DVD player doesn’t have an eject button. Logitech’s database had a code for eject that I could program into the Harmony 880. Another remote I have for a Yamaha CD player got mauled by the dog. I was going to replace it for $35 but now I don’t have to. I haven’t mentioned the comfortable grip or the numerous design awards the Harmony 880 has won. No wonder Logitech bought the company. Below is a photo I took of the remotes I used to use. If you’re looking for a solution to the remote control clutter in your home theatre then check out the Harmony 880.